Did You Catch the Symbolism of Hillary Clinton's Purple Suit? When Hillary Clinton delivered her concession speech this morning, she urged the country to “never stop believing that fighting for what’s right is worth it.” That message was reiterated in her clothing, as well. Even though fashion is perhaps not front of mind as we prepare to welcome a new era of American politics, this subtle—yet powerful—connection between what politicians wear and the messages they send was not lost on the fashion world. Clinton was dressed in a black Ralph Lauren pantsuit with striking purple lapels and a shell top. The colour choice, often associated with royalty, was far beyond arbitrary. As many who weighed in on Twitter remarked (see here and here), purple is also a shade that’s created when red and blue, the signature colours of the Republican and Democratic parties, respectively, mix. 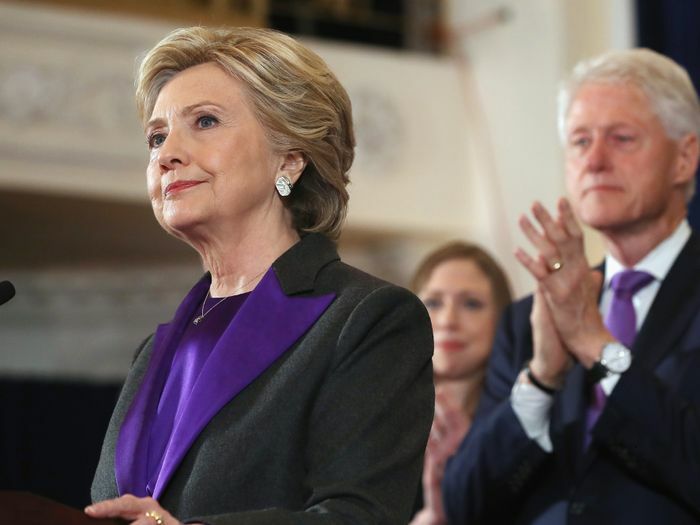 With this is mind, Clinton's purple ensemble is suspected to be a symbol of bipartisanship and unity. Going one step further, according to the National Woman’s Party, “Purple is the colour of loyalty, constancy to purpose, unswerving steadfastness to a cause.” It’s a description that instantly draws parallels to Clinton’s own dedication to her career and public service, something that even her opponent praised in his acceptance speech last night. Of course, this is not the first time that Clinton has the public wondering about the intent behind her clothing—nor for Michelle Obama or Melania Trump—yet today's fashion choice helped drive home one very important message: We have a lot of work to do, and we all need to do it together. Scroll down for a peek at Clinton's significant ensemble. See the eight reasons why we'll miss Michelle Obama's style so much.